I love all of my clients (really, I do! ), but I especially love designing for my single ladies. There is something so fun about working with a woman who is creating her dream space, with her singular, uncompromising vision. I have been lucky to work with a handful of fabulous bachelorette babes, but honestly, they haven't all had the most "girly" taste...which is awesome, but sometimes I just want to get my pink on! And I live with a man, so even though we have a healthy dose of my favorite shades of pinks in our apartment, sometimes I want to stretch those muscles and do something that is all out, unapologetically feminine. Or my take on feminine, which is not so much frills and florals, as it is ethnic textiles, warm woods, dreamy photography, and an extra helping of pink! Not that pink is anything new. Millennial pink has definitely been having it's moment in the sun. Some might say that pink is already over. Rose quartz was the 2016 Pantone color of the year, after all (don't get me started on 2017 or 2018 colors...that's a whole different rant I don't have time for today). But I would argue that pink is a classic. It might cycle in popularity, but it always comes back around. 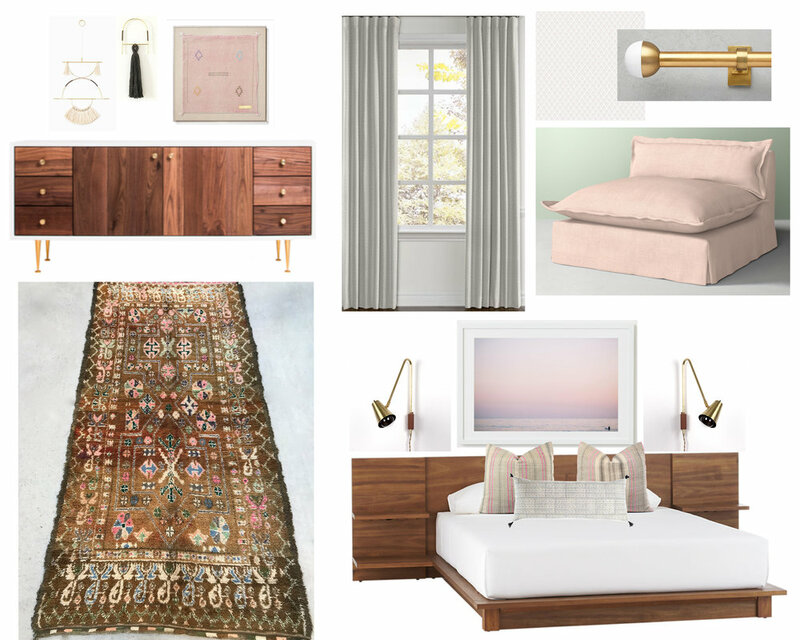 So, without further ado, here is one of my takes on incorporating pink in a mood board I'm calling "Boho Bachelorette Bedroom".